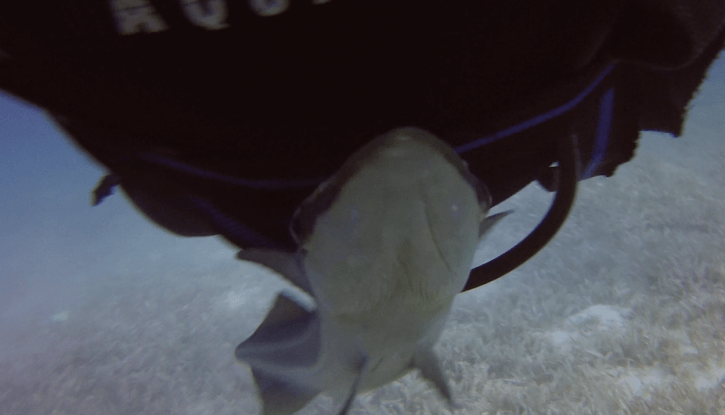 Home Trip Reports Jim’s Jawsome Shark Quest! 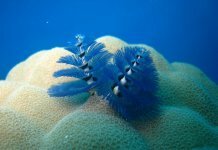 Ever since I was little I have been fascinated by these amazing creatures and after a visit to an aquarium, I knew that I wanted to spend my life diving with as many different species as I could. I’ve been very fortunate in my time to see all sorts of sharks in the wild and I’m always keen to add some new ones to my logbook, so when I was told I was off to the southern Red Sea on the very first Shark Quest trip I knew I was going to be in my element. It would also be my first trip to the south so I was excited to see how it compared to the northern Red Sea. I would be heading out in late January, similar to my last trip to the north so it would be cool to compare the same time of year in the two locations. Despite an early start (I didn’t know clocks had a 3 am) the flight down to Marsa Alam was fairly painless. 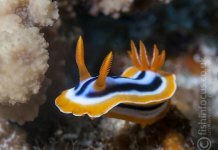 I was travelling with my buddy John, a rescue diver with similar Red Sea trip history as myself albeit with less experience. It would be interesting to get his take on the week as well as my own. We were met on arrival by the ground team and after picking up our bags we were taken to the boat. The Mistral would be the ship we would be calling home for the week. A steel-hulled vessel rather than the wood of the Whirlwind I was on last year, Mistral is incredibly stable in the water. This is something I would appreciate as possibly the world’s most seasick man travelling when the weather is a bit windy. Its large saloon and dining area is very comfortable and bright, with the cabins being on the decks above and below. I was in a lower deck cabin, a twin bunk arrangement of double bed below a single bed. As I was lucky enough to have a cabin to myself, I took the comfy double and used the single for extra storage. The upper deck cabins are all straight double rooms, but as they were all occupied it seemed rude to barge in and look around. We were immediately made to feel at home by the crew and our guide for the week, Yassir. They helped with setting up kit and afterwards a delicious meal was served. This was a taste of things to come (pun very much intended) as the food was delicious and plentiful, very much up to the fleets very high standard. Any and all diets were catered for over the week and it was so good that I’m sure I put on a few kilos to the waistline and took a few off my weight belt to match. 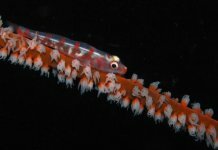 After spending the first night on board we moved out to our first site to make our check dive. 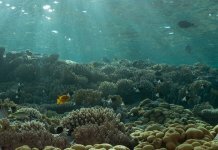 The site chosen to blast out the cobwebs was Ras Torombe, a colourful reef system fairly close to shore around an hour or so north of Port Ghalib. There was plenty of fish life and coral cover to keep us busy, with dozens of Blue Spot stingrays hiding under rocks and a few little nudibranchs to test our spotting skills. I decided to sit out the night dive so after another excellent meal and dosing up on seasickness pills, we started off on the 8-hour steam to our first destination, the Brothers. Before we go any further, it’s worth talking a little about the itinerary itself. 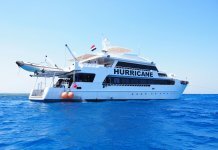 The Shark Quest is a little different to other trips in the southern Red Sea, as rather than following a concrete checklist of dives the plan can be a lot more flexible. If there are sharks at a site, we would hang out there to get as many great encounters as we could. If not, we move on. Based on the intel from the week before, our main area of attack would be the Brothers as this was where the majority of the shark sightings took place. As a result, we would be spending 3 days diving around the two islands before moving on to Daedalus. The next morning it was time to go shark hunting! Dropping down to the southern plateau on Little Brother, we hung out waiting to be joined by the sharks. There were fish everywhere, more Anthias than you could shake a stick at and a turtle chomping away on some sponges hidden amongst the soft coral. We had a few small reef sharks swim along with us but as the boat came into view we were greeted by a pair of beautiful Oceanic Whitetips. Each was between 1.5 to 2m long and took it in turns to approach us and see what was going on. I was in awe of these serene animals, calmly cruising along with a flick of their large, wing-like pectoral fins with dirty white splodges on the tips. Accompanying them was a small shoal of Pilot fish, eager to grab any scraps of food left behind by the shark. Soon it was time to resurface and eat some more delicious food but we decided to spend the next dive under the boat hanging out with the sharks. There was only one with us by the time we had gotten in but we didn’t care, I didn’t even notice the time but we had been watching her for an hour. The shark spent the whole time coming very close to check us out before heading back out into the blue, approaching each of us in turn and posing for our photos. The third dive was to the north of Little Brother, taking the zodiac out and drifting to the boat on the current. The rough surface conditions belied a calm dive, and the cruise back to the boat was amazing. Vibrant soft corals, gigantic Humphead Wrasse and plenty of reef fish to see, the current slowly pushed us all the way home. As a cherry on top, there were Oceanic whitetips the greet us as we entered the water and again under the boat as we left it. 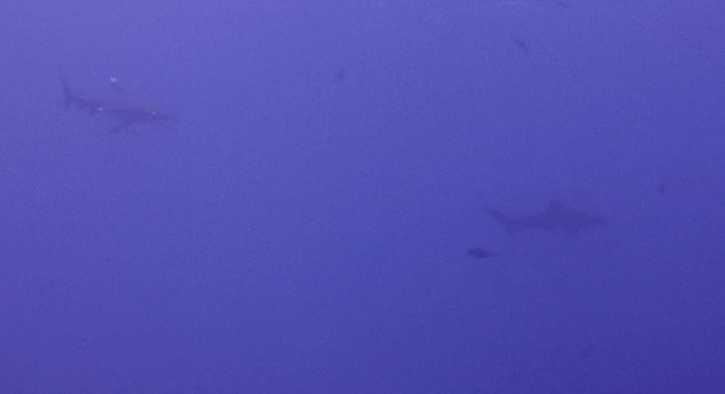 The next morning, we woke early to see if we could find any Hammerheads. Hanging out on the southern plateau, the hammerheads proved to be elusive but we saw something even better. Cruising along with us was a Pelagic Thresher, one of my favourite sharks and one I had not seen since leaving the Philippines nearly 8 years ago. 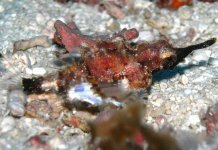 Bizarrely, it appeared as though it had lost some of its amazing long tail, giving it an appearance more like a reef shark. The long pectoral fins and big eyes gave it away though, what a result! After the morning dive, we shifted our focus to Big Brother, with our first dive dropping us on the Numidia wreck to drift back to our boat. There are not many wrecks in the southern Red Sea so the two on Brothers would be the only rust we would see. No matter, it’s not what we were there for! Sinking down slowly to the wreck, past a curious Oceanic whitetip, I was impressed with the sheer amount of coral cover plastered all over it. 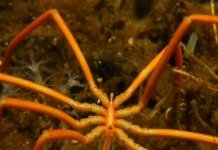 Although there is plenty to see at recreational depths, most of the wreck is past 40m so after a look we soon drifted away along the wall. Much like Little Brother the walls are covered in beautiful life with hard and soft corals, fish of all shapes and sizes and shoals of Anthias you could measure in thousands. 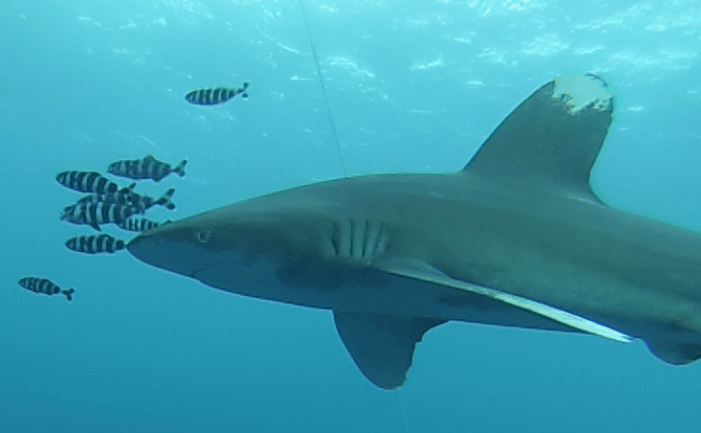 The final dive of that day was spent under the boat with 4 Oceanic whitetips. The others were heading to the Aida but my buddy and I were there to see the sharks. We were treated to a fantastic personal encounter with the animals that would approach one at a time, with the rest of the shoal hanging back at the edge of the viz. 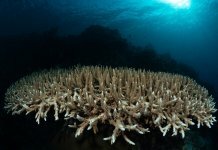 Each was around 2m in length and filled me and John with a respect and awe that still now sends a shiver down my spine. A few had embedded hooks in their jaws which was sad to see but at least they were still swimming around and not in a market somewhere. The second day on Big Brother was another ripper with 3 great dives around the various points of the islands. 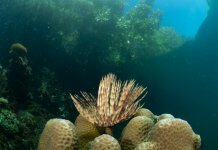 We were treated to some truly stunning dives, drifting on the walls amongst the coral and fish life, having a look further into the Numidia and hanging out with the Humphead wrasse and the Oceanic whitetips of course. That night was the 11-hour transfer to Daedalus and the surface conditions were a bit choppy, so dosed up and holding on, we charged into the night! 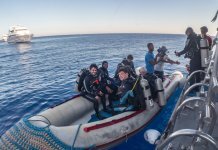 Daedalus was keen to greet us as the sun came up over the southern Red Sea and we were equally keen to get in the water! We headed out to the northern plateau to hunt some sharks and our good friends the Oceanic’s were there in abundance. Drifting back along the walls again was an amazing way to spend a morning, with the fish shoals swirling around us the entire way down. The next two dives were equally as beautiful, tripping over Oceanic’s, Humphead wrasse and stunning soft coral, with the current pulling us along it was difficult to know where to look. The Anemone City was a particular highlight, huge swaths of anemones and hundreds of clownfish eager to pose for photos. I took the opportunity to visit the lighthouse on my surface interval, climbing to the top for a bird’s eye view of the atoll and surrounding sea. A refreshing Egyptian tea and a shisha smoke with the lighthouse keepers waited for me at the bottom, where we talked about where were all came from and our love of Egypt, sharks and the sea. I would have loved to have stayed longer but the dive bell was calling for me. Overnight we travelled to Elphinstone to see what we could find down there. We dropped into the north after a bouncy ride out (Bill called us the Navy SEALs!) and went looking for some hammers. Blasted things had slept in so we had to make do with the Humphead wrasse and the thousand-strong shoals of fish as we drifted along. During our surface interval, the surface conditions degraded so we all decided to go dugong hunting back at Ras Torombe in the seagrass meadows. Our first dive there was a colourful, shallow reef with dozens of Blue-spotted rays peeking out from under the corals. 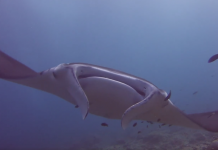 We were joined along the way by a large Remora which promptly latched onto me as the largest thing nearby. Due to its size, we were sure it must have come off something big. Sure enough on the second dive, we found it. 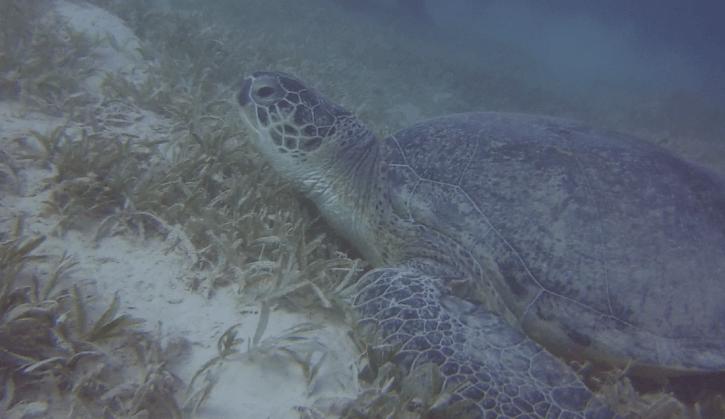 Two huge turtles were feeding on the seagrass, each one must have been 250kgs plus and they chomped away at the shoots completely indifferent to our presence. No dugongs but I’m always happy to see turtles. We spent the last night on board before making our way back to port. Saying our goodbyes to the crew, exchanging Facebook addresses and shaking hands, we were taken to our day use hotel while we waited for our flight. The Resta Grande was a great place to spend some time, with comfortable rooms, delicious food and the greatest shower I’ve ever taken! The return flight was a simple, uneventful affair. With the restrictions on electrical goods removed, I had plenty to keep me entertained. I was home before midnight the same day. Result. The Shark Quest is a great way to spend some time in the water. Obviously when you head out there will dictate what kind of sharks you encounter. We had more Oceanic Whitetip encounters than I ever thought we would have, why not get in touch with what you saw! While the surface conditions could be a bit rough, making the zodiac rides a bit bouncy, the conditions underwater were fantastic. Slack currents and warm water made the dives very enjoyable. My one bit of advice would be to bring a jumper, the wind was pretty cold in January. If this sounds like the trip for you, give us a shout and we’ll get you out there. I can’t recommend it highly enough! Why not jump on our next trip, heading out on the 1st of March? It’s currently got a great deal on it, taking the cost down to just £1045 per person! Better yet, share the sharkyness with a buddy and pay just £995 per person if you book before 14th of Feb! Or if photography is your thing, our in-house photo pro Mario Vitalini will be running a Shark Quest photography trip on the 30th of May 2018. 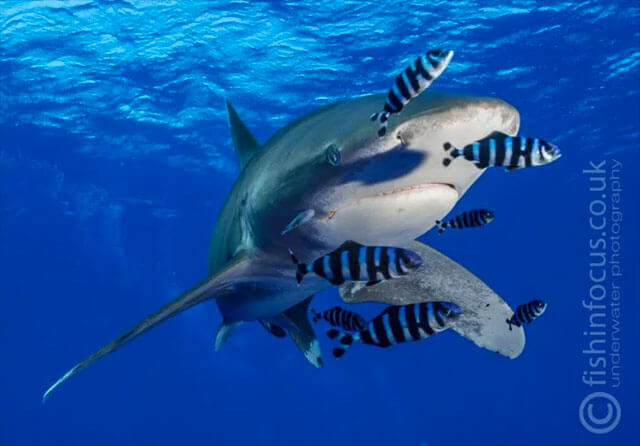 You’ve probably already seen some of his amazing Oceanic Whitetip shots (such as the one below) in other articles, so why not learn from the master.